To document clinical characteristics of paediatric patients diagnosed with Chronic Recurrent Multifocal Osteomyelitis (CRMO). To collect data on the disease’s imaging, outcome and management. We retrospectively reviewed clinical characteristics, radiological data and treatment in paediatric CRMO patients, followed at our institution paediatric rheumatology department. Of the twenty-five patients enrolled, bone pain was the leading symptom (24/25 patients). On imaging, 148 lesions were identified with an average of 5.9 lesions per patient. The most common sites involved were the vertebrae (37%) and lower limbs (31%), followed by the pelvis (10%) and clavicles (9%). Our data confirm the known propensity for clavicle involvement, reaching 40% (10/25) of our patients on imaging, and 9/25 based on the pain symptoms. In our cohort, conventional radiographs showed characteristic lesions of osteolysis, sclerosis or mixed patterns. CRMO lesions are described in early stages as osteolytic, and the sclerosis and periosteal reaction mostly occurred afterwards due to the healing process. 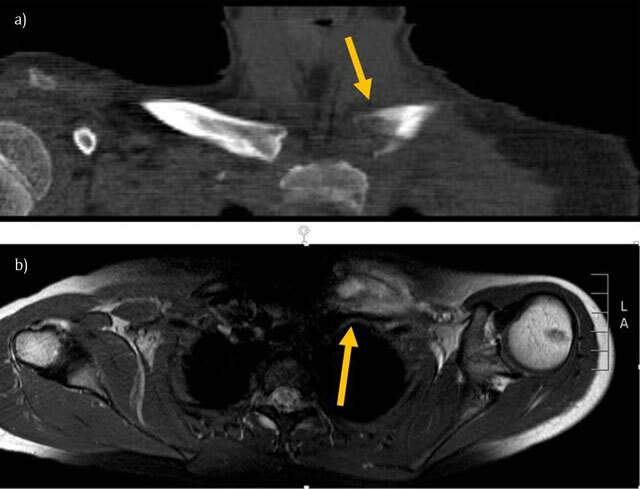 In most cases CRMO showed a typical pattern of bone involvement on Magnetic Resonance Imaging (MRI): multifocal, T2-weighted hyperintense geographic lesions at the metaphysis and epiphysis adjacent to the growth plates of tubular bones. In general, lesions present as areas of bone marrow edema, which additionally implicates low signal intensity on T1-weighted images and contrast enhancement. CRMO in a 9-year-old girl with pain at the left clavicle (medial). a) Coronal computed tomographic image shows expansion of the medial clavicle with osteolysis. b) T2-weighted MRI shows edema of surrounded soft tissues and sternoclavicular hyperostosis. 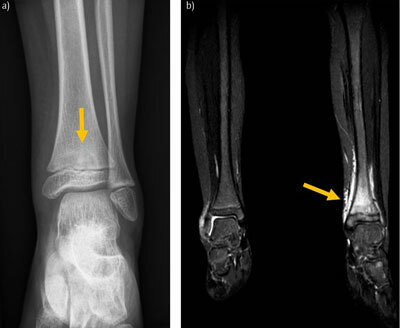 CRMO in an 8-year-old girl with left ankle pain and swelling. a) Plain radiograph of the left ankle shows a lytic lesion of the tibial metaphysis surrounded by a sclerotic rim. The lesion extend across the epiphyseal growth plate. b) Coronal STIR (fat suppressed T2-weighted MRI) shows bone marrow edema involving the distal tibia metaphysis and extending across the physis into the epiphysis. There is also edema in the surrounding soft-tissues. We present a paediatric cohort of twenty-five CRMO patients. The distribution of the bone lesions on imaging was consistent with published data. A phase-specific typical pattern of involvement could be found on imaging.